Social unrest increased; there were nearly twice as many protests between January and August as in the whole of 2008. The protests were sparked by issues such as discontent over labour rights and basic services, including a new education law opposed by the private education sector and the political opposition. The National Assembly debated the possibility of legal reforms to regulate the use and possession of small arms, including harsher sentences for possession of weapons. According to the National Assembly&#39;s Security and Defence Commission, there were between nine and 15 million illegal firearms in circulation. Reforms to the armed forces in October included provisions allowing the creation of militias. Ten police officers charged with criminal offences in the context of the 2002 attempted coup against President Chávez were sentenced to up to 30 years&#39; imprisonment in April. They were convicted of homicide and grievous bodily harm against anti-coup protesters amid concerns that not all of those who committed acts of violence in the context of the attempted coup had been brought to justice. Journalists were harassed, intimidated and threatened. At least 34 radio stations had their licences revoked for non-compliance with statutory telecommunications regulations. However, as noted in August by the Special Rapporteur for Freedom of Expression of the Inter-American Commission on Human Rights, the authorities&#39; public statement that these stations &quot;play[ed] at destabilizing Venezuela&quot; indicated that their editorial stance could have been the actual reason behind the closure. There was concern that a draft law which would criminalize the dissemination of information in media outlets which was &quot;false&quot; and could &quot;harm the interest of the state&quot; could undermine freedom of information and expression. The law remained before the National Assembly at the end of the year. Members of opposition political parties were harassed, threatened and intimidated, including by the use of spurious criminal charges. On several occasions the security forces failed to intervene when government supporters physically attacked suspected opponents. Progress in the investigation and prosecution of cases of domestic violence remained slow. More courts and prosecutors&#39; offices specializing in dealing with gender-based violence were established. However, the numbers remained insufficient to deal with the high volume of cases. 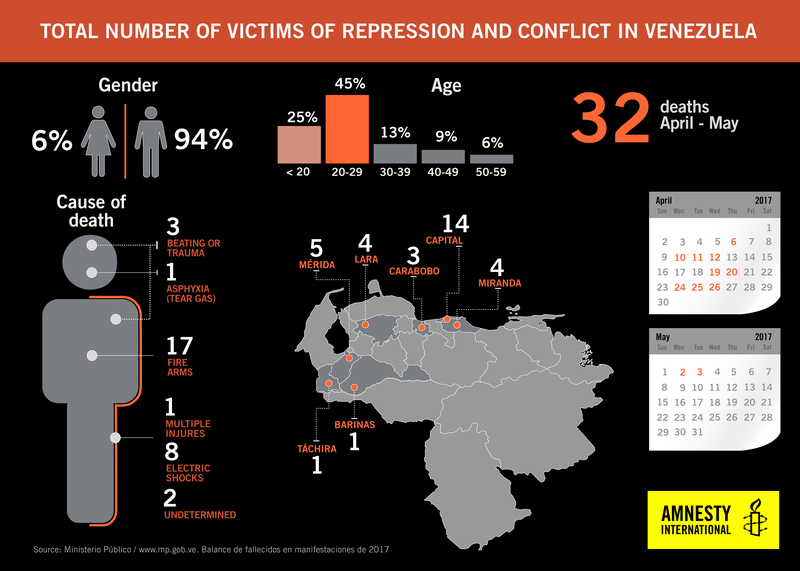 The Public Prosecutor&#39;s Office in Caracas stated that it had received more than 12,000 complaints between January and August and that only half of those received could be dealt with. Severe violations of the right to health, as well as difficulties accessing food and other basic services, are putting thousands of people’s lives at risk in Venezuela and fueling a regional forced migration crisis, Amnesty International said today on the launch of its digital platform Emergency Exit. The arrest of four officials from the opposition in Venezuela, the removal from office of a further 11 and the issuing of arrest warrants against another five, demonstrates the Maduro administration’s tightening stranglehold on any form of dissent, taking repression to a frightening new level, said Amnesty International.